Are you seeing a pattern here? Moskowitz and her pals don't want to bother with all that messy certification nonsense. They want to do it their way and take whoever they want. And why not? Their teachers aren't unionized and don't last anyway. When this one goes, just open another can. Reformy Bellwether Education wants to do away with pensions because they're supposedly unfair to the people who quit after five minutes. Now here's a piece saying do away with certification altogether. This is not a new idea. Self-styled education expert Nicholas Kristof suggested this years ago. Evidently Merryl Streep and Colin Powell were unqualified to teach.The fact that neither one of them had any desire to teach was neither here nor there. New York City students were being deprived of imaginary teachers, and we needed to address this crisis immediately! The new arguments are not much better, actually. Funding per student has been rising sharply for decades, resulting in lower class size, but such expenditures seem not to have succeeded. I don't know what planet this guy lives on, but here in NYC, the opposite has occurred. In fact, there's a lawsuit right now trying to change it. We are the largest district in the country, with the highest class sizes in the state. The writer should be delighted to learn that maximum class size is now pretty much standard. Doubtless he'd revel in our busting-at-the-seams overcrowded school. The key to successful education is to attract good teachers. We can try to do so by raising teachers’ salaries (as commonly advocated). But this strategy also seems to fail, partly because higher incomes go to both good teachers and bad, giving bad teachers as much incentive as good ones to become and remain teachers. I don't remember much about economics, but there is the whole supply and demand thing. In fact, as you'll see, it's pretty much the crux of this writer's argument. 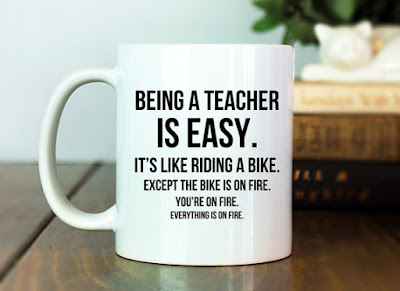 But it doesn't apply, evidently, when it comes to, you know, paying teachers. The fact that half of them walk before they hit five years is neither here nor there. Then there's that bad teachers trope. Evidently they are everywhere, though there is little or no evidence to support this supposition. How can this be? Despite much research, nobody can say what skills, qualities, or training good teachers need. So therefore, let's drop requirements altogether. That's what passes for logic in this piece. So, now that we've given up certification requirements, how do we weed out those bad teachers wandering the landscape like a zombie plague? By far, the most effective way to improve teacher quality is to require administrators to selectively retain, after the first few years of experience, only the more effective teachers. The biggest barrier to improving teacher quality is therefore union contracts that block such selective retentions and, with lock step pay, eliminate success-based compensation. Okay, let's examine that. Given the plague of zombie bad teachers, we need to address this crisis. But on the other hand, who hired these zombies? My guess it was the administrators, you know, the ones we're depending on to weed out the bad teachers. Who failed to get rid of this plague? Right again, the very same administrators. And wait, isn't there already a means of firing teachers for performance? Haven't we just enacted not one, but two laws to accomplish that in New York? And didn't Race to the Top insist on teacher certification requirements in all the states that took the money? Let's take a look at "success-based compensation," otherwise known as merit pay. In fact, merit pay is an old, old idea that has never worked anywhere. Let me tell you something--I've outlasted many trends and one thing I can tell you is I've never made a whole lot of money. I'll also tell you I don't work for tips, and suggesting that I do, or that anyone does, will not stem the tide of teachers walking out the door. The notion that it is difficult to get certified is pretty ridiculous. Hey, if it's too much trouble for you to get twelve education credits, maybe this isn't the job for you. The notion, propagated by this writer, that colleges don't require certification is equally ridiculous. For me to work as an adjunct teacher of English as a second language, I needed a master's degree in applied linguistics. I didn't just grab it off a tree like an apple. If you want to work on a tenure track, for the few that are still around, you'd better have a doctorate, and not one of the ones you buy online for $169. I don't know about you, but I'm a little concerned about who gets in front of my children, or yours. I'm not remotely comfortable with Eva Moskowitz, who keeps kids in test prep until they pee their pants, getting to decide. I'm not comfortable with abusive teachers who lack the common sense of salad vegetables. So I'm sorry, but inconvenient as it is, I think we need standards for teachers. If the ones we have are too difficult, or not relevant enough, we can amend them. The notion of dumping them is part of a larger pattern, a pattern designed to eliminate career teachers and make us replaceable cogs. We devote our lives to teaching American's children, and we deserve better. And for those who blather on about placing children first, our children deserve better too.